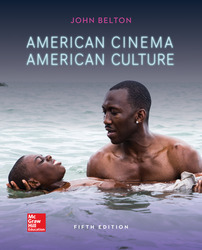 American Cinema/American Culture, 5th Edition, looks at the interplay between American cinema and mass culture from the 1890s to 2017. Students are introduced to the cultural history of film focusing on topics and issues rather than on rote learning. This introduction to American Cinema is ideal for introductory courses of American cinema, American film history courses, and introductory film appreciation courses. The text provides a cultural overview of the phenomenon of the American moviegoing experience, engagingly written in a lively and entertaining style by John Belton, a preeminent scholar in the field of film studies.